Born in a rural village in western New York, Andrea Baldeck began photographing with a simple box camera at age eight, imagining herself a Life photographer canoeing through the jungle to meet Albert Schweitzer. This interest and dream pervaded years of musical study at Vassar, medical school at the University of Pennsylvania, and practice as an internist and anesthesiologist. On medical trips to Haiti and Grenada, camera and stethoscope occupied the same bag. 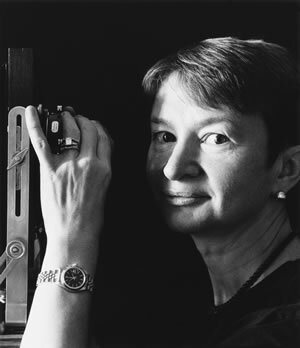 In the early 1990’s she left the operating room for the darkroom, to work as a fine-art photographer in black and white. During the following decade, her portfolio grew to accommodate portraiture, still life, and landscapes, as featured in her books The Heart of Haiti (1996, second edition 2006), Talismanic (1998), Venice a personal View (1999), Touching the Mekong (2003), Closely Observed (2006), Presence Passing (2007), and Himalaya: Land of the Snow Lion (2009) Since 1996 she has exhibited widely in the U.S. and abroad, and her images are found in museums and private collections. When not in the darkroom, she explores mountain peaks, far-flung islands, fields and gardens, seeking to entrap the transient through the magic of her photography.